Siena is hosting an exhibit revealing the damage done by October earthquakes in Norcia and the surrounding areas, about 126 miles to the southeast, in its Duomo crypt and the Santa Maria della Scala Museum complex. The exhibit, called La Bellezza Ferita: Norcia EarthHeartArtQuake runs through October 29 and displays damaged and ruined artwork alongside footage of the disasters. Three people died and about 100,000 were left homeless when the series of three strong earthquakes – magnitudes 5.5, 6.1 and 6.6 – struck the Norcia area on Oct. 26 and 30, 2016. The quakes devastated towns and flattened buildings, including homes, business, and churches such as the 13th-century Cathedral of St. Benedict, Norcia’s main cathedral, and its attached monastery. The exhibit’s goal is to protect surviving artworks from further damage and tell the story of the devastation that occurred to both Italians and foreign tourists, as well as to encourage conversation on how to restore the artworks and protect them from future earthquakes. The paintings and sculptures in the exhibit were previously displayed in churches. 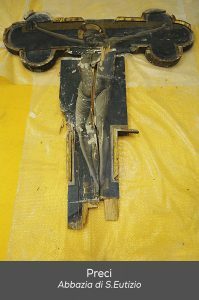 Many of the pieces, which belong to the Archdiocese of Spoleto-Norcia, were held in storage in Norcia and are in public view for the first time in years. Eyewitness accounts of the earthquakes, photos, and videos were collected by local photographers and the National Fire Brigade. Visitors can view the exhibit during regular hours for the Duomo crypt and Santa Maria della Scala. Part of the proceeds from the exhibit will be donated to earthquake recovery efforts and survivors.